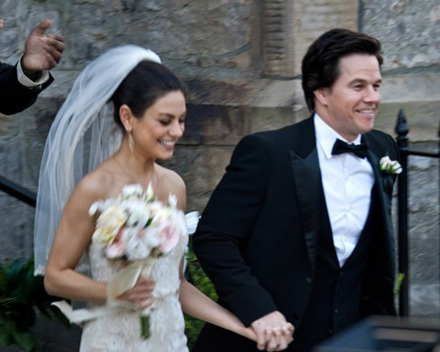 Yeah, the misleading headlines that Mila Kunis and Mark Wahlberg are tying the knot cannot fool the flick geeks. 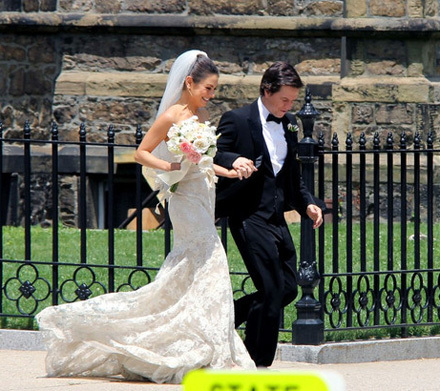 We know that these two were shooting a wedding scene from their latest romantic comedy called Ted in Boston on June 30th. The movie by Seth MacFarlane (Family Guy) is about John (Mark Wahlberg) from Boston and his live teddy bear Ted (a childhood dream come true) whose lifestyle and err…personality hinder John’s endeavors to win over a girl Lori (Mila Kunis). 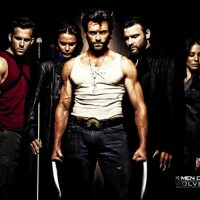 The flick is set to be released in July 2012. Meanwhile we get to enjoy smiling Mila Kunis in stunning cream lace fishtail dress and Mark Wahlberg in sharp dark tuxedo and bow tie. This is not the first rom com with Mila Kunis who also has a movie Friends with Benefits out on July, 22, this year, featuring Justin Timberlake as love interest. Is MIla the new “it” girl?